The Lions were completely overwhelmed from the stoppages, conceding a seasonhigh 75 points from clearance chains. They were well beaten on the inside, losing the contested ball by at least 30 for the sixth time in 2016. John Butcher finished with a gamehigh 11 marks to go with four goals, his equal second-highest tally in any game across his career. It was his most goals in a game since the Round 5 Showdown against the Crows in Round 5, 2012. Jackson Trengove has completely dominated against debutant Archie Smith, recording 24 disposals, 19 contested possessions and 14 clearances. Travis Boak and Robbie Gray have played major roles, recording 17 score involvements apiece. Gray has also recorded an equal gamehigh 31 disposals. 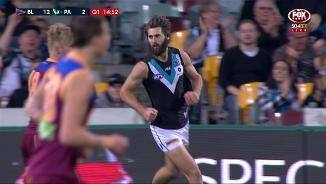 Port Adelaide recorded its 27th mark inside the forward 50. Its tally of 154 points is only the second time it has booted 150 or more points since 2010. Oliie Wines has recorded an equal teamhigh seven ineffective kicks. His kicking is an area of his game that can improve, recording the lowest kicking efficiency of the top 50 ball-winners in the AFL (40 per cent). The Lions haven't been able to generate a score from a ball up clearance, losing the clearance tally 11 to six. It has conceded 21 points to the Power via that source. The margin in this match could have been far greater had the Power converted their attacking opportunities, recording 8.13 directly from marks. Port Adelaide is looking to finish the game in strong fashion, generating six inside 50s to one already in the final term. Tom Rockliff and Pearce Hanley have had little impact on this game, recording just one mark and two tackles between them. Port Adelaide's 19 uncontested marks inside 50 to three quarter time is the most of any side in any game in 2016. John Butcher has recorded a gamehigh of five. Port Adelaide continues to pile on the offensive pressure, recording 76 disposals to 28 inside 50. It had out marked the Lions 24 to just eight in that zone. 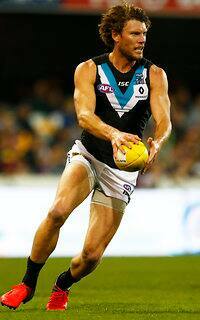 Port Adelaide has recorded a seasonhigh 21 marks inside the forward 50. Its previous best tally was also against Brisbane when the sides last met in Round 7. The Power have launched their fifth goal of the match from a defensive 50 chain. They have generated 32 points to just eight from the Lions via that zone. 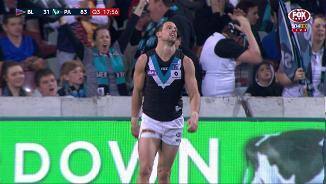 Port Adelaide has already exceeded its highest point tally to three quarter time this season, recording 109 points, 10 more than in any other match. The Lions haven't been able to stop Port Adelaide finding marks inside 50, with the Power recording 19 marks in that zone for the match compared to the Lions' six. Jasper Pittard hasn't been able to get into the game, managing only five disposals. He has reached 20 disposals in all but two games this season to average a careerhigh 23. Jarman Impey becomes Port Adelaide's fifth multiple goalscorer for the game with his second major. John Butcher has a gamehigh three goals. Lions InterchangeArchie Smith off due to an injury. The Lions were well beaten in most of the key measures in the second term, but it was their goal conversion that let them down the most, scoring 0.5 from 11 inside 50s. John Butcher booted three goals in the second term and was a focal point in attack for Port Adelaide. It's Butcher's equalhighest goal tally to half time in his career. Port Adelaide has scored nine of the last 10 goals to break the game wide open. It leads time in possession 68 per cent to 32 per cent in the past 10 minutes. Port Adeladie's ball movement from defence has been decisive, with 46 per cent of its defensive 50 chains resulting in an inside 50 compared to Brisbane's five per cent. Port Adelaide has recorded 10 of the past 14 inside 50s of the game to open up a gamehigh 17-point lead. Aaron Young hasn't made the most of his opportunities for the Power recording three behinds. He ranks second at the club for scoreboard impact this season. Eric Hipwood is the only Lions forward to record more than one mark inside the forward 50 (three). He has been off target though scoring 1.2. Port Adelaide has doubled Brisbane's scores from turnover, recording 4.4 (28) compared to its 2.2 (14). The Lions have however outscored the Power by nine points from clearance chains. Travis Boak is having a major impact for Port Adelaide with eight disposals. He has been involved in a gamehigh seven scoring chains, which includes scoring one goal. Postclearance the Power is well on top, winning the disposals 87-54, marks 28-8, contested possessions 32-20 and handball-receives 36-24. The Lions trail at quarter time for the 15th time in 2016. They have led at quarter time just three times which is the equalfewest of any side alongside Essendon. Power InterchangeBrad Ebert off due to the blood rule. Chad Wingard scores the Power's second goal directly from a free kick. The Power have recorded 17 effective kicks to just five in the past 10 minutes of the game. Port Adeladie has controlled the opening term, recording 15 inside 50s to just five. It has been wasteful from set shots, scoring 2.3 compared to Brisbane's 3.0. Ben Keays is one of five Lions players yet to record a disposal. Jasper Pittard is the only Port Adelaide player yet to win a disposal. Port Adelaide has been strong in aerial contests, recording six contested marks to none. 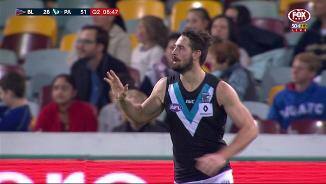 Jackson Trengove has recorded a gamehigh two. Josh Walker boots the Lions third goal of the match and their second from beyond the 50 metres arc. They have recorded three scores from only four inside 50s. Daniel Rich has started well early with a gamehigh five disposals. Matthew Broadbent has continued his recent good form with four disposals for the Power. The Lions are on the board early with two straight goals. 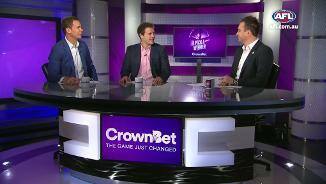 Their scoring accuracy of 61 per cent since Round 14 is the fourthbest strike rate of any side. The Lions have kicked 14 goals from kickins this season - ranked second in the competition. 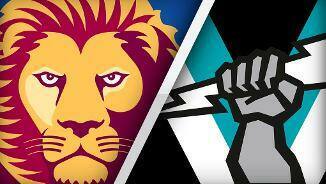 Port Adelaide won its Round 7 clash against Brisbane by 87 points. It won the clearance count by 15, its secondbest differential in any game this season. Welcome to Gabba for the Brisbane Lions v Port Adelaide Round 19 clash. 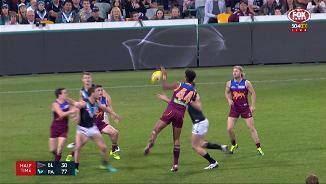 IN AN all-too-familiar tale at the Gabba in 2016, Port Adelaide has embarrassed the Brisbane Lions on Saturday night, winning by 94 points. It started well enough for the home team – they kicked three of the first four goals – but the wheels fell off in a hurry as the Power stormed to a 25.23 (173) to 11.13 (79) victory. They kicked seven unanswered goals in the second quarter and another seven in the third to blow the game open. It is the highest score by any team this season. 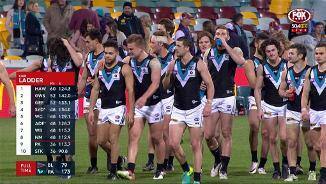 Port coach Ken Hinkley said there was a lot to like about the performance. "We had somewhere close to 80 entries, had a lot of opportunities, took a lot of marks inside our 50, kicked a big score," he said. "If you look at the way we play, the way we perform, … it's a pretty big tick. "I liked that part that we were able to be quite ruthless in the way we went about it and they just kept at it. It was pleasing." It was a crash, more a thud, back to earth for the Lions just six days after snapping a 12-game losing streak with a morale-boosting win over Essendon. But for all the endeavour and effort they showed against the Bombers, it was missing against a Power team that worked relentlessly and killed off a lackluster opponent. Midfielders Ollie Wines (32), Robbie Gray (32), Jared Polec (25) and Travis Boak (24 and three goals) filled the stats sheet. 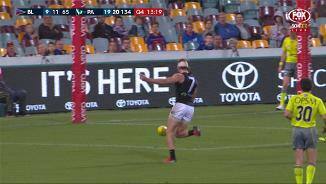 Chad Wingard kicked possibly the easiest five-goal bag in the game's history. Two came from 50m penalties, another from a free kick, another a gift in the goalsquare and the last via an intercept mark from an errant Sam Mayes kick-in. John Butcher, playing just his second game of the season, kicked four goals and took 11 marks in a promising showing. 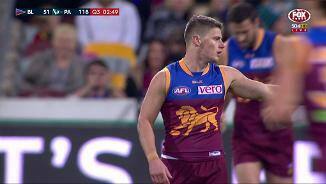 The damage could have been far greater for the Lions if Port kicked straight. They had plenty of chances, going inside 50 a staggering 77 times. 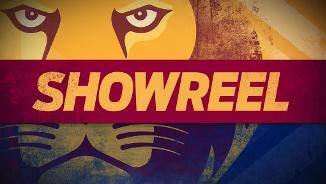 It was a storyline Lions fans have seen far too often at the Gabba in 2016. They have also suffered heavy home losses to Collingwood (78 points), Fremantle (83 points) and Greater Western Sydney (79 points). This loss is sure to heap pressure on coach Justin Leppitsch again, who described parts of the performance as unacceptable. "There's parts of today that were embarrassing, and I think the boys felt that too," he said. "We got beaten tonight on the inside and the outside, which happened in the Giants game, and that game was also a bit embarrassing. "They're a very good hard-running team when they're up and going, and we allowed that today." Perhaps the most damning thing for the Lions was that debutant ruckman Archie Smith was undoubtedly the team's best player, showing up his more experienced teammates with his tenacity and hunger to compete. Smith, who only switched from basketball three years ago, finished with 19 disposals (17 contested – a team high), nine clearances, another team high, 30 hitouts and five tackles. Port Adelaide transitioned the ball superbly from its back half, twice going coast-to-coast in the match-winning second quarter. The Lions' lack of accountability in their defensive running was, at times, staggering. 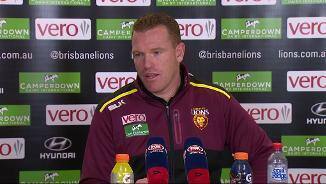 Brisbane Lions: They've suffered their fair share of injuries this season, but the Lions got through this one well. Smith copped a knock to his shoulder and missed 10 minutes during the third quarter, but came back to finish the game strongly. Port Adelaide: The only problem for Port came prior to the match when Hamish Hartlett (replaced by Jimmy Toumpas) was a late scratching with a calf injury. Hartlett strained the muscle in the warm-up and had to pull out. 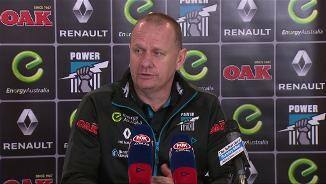 Coach Ken Hinkley said he was a chance to play next week. Port Adelaide goes on the road again next week and faces the stiff assignment of the Sydney Swans at the SCG. While mathematically they still have a chance of playing finals, they're now three games behind eighth-placed North Melbourne with four rounds to go and may be playing for pride only. It doesn't get any easier for the Lions, who travel to Adelaide to take on the powerhouse Crows.